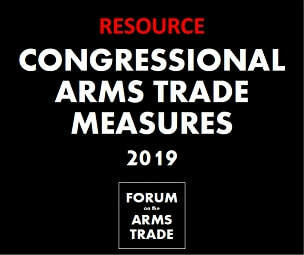 In 2019, members of the U.S. Congress will propose a range of legislation addressing the arms trade, security assistance, and military support. 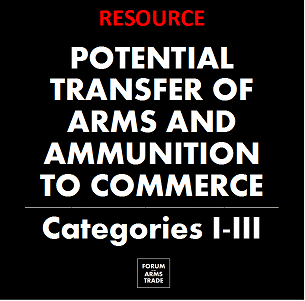 This resource page will be updated frequently to provide information about key measures that Forum on the Arms Trade-listed experts* are tracking and about which they can be contacted for analysis and opinion. If there is legislation you believe should be included, please email us at info@forumarmstrade.org. March 13, 2019 -- "The Senate has now taken a decisive step in ending the American facilitation of the Yemen war and the world’s largest humanitarian crises. Millions of grassroots activists, who helped make this vote a reality, want their lawmakers to end this unconscionable war." See full FCNLstatement. Feb. 13, 2019 -- “Just a couple years ago, members of Congress would tell us privately that they didn’t know Saudi Arabia was waging this war, let alone that the United States was enabling it. Grassroots pressure was critical in educating members of Congress about this unauthorized war.” See full FCNL statement. March 13, 2019 -- “The Senate moved the country one step closer to ending our participation in fueling one of the largest humanitarian crises the world has ever known. The House now needs to act quickly so that Congress can speak with one voice in calling on Donald Trump to end this unauthorized war in Yemen for good.” See full Win Without War​ statement. Feb 13, 2019 -- "Today, after years of organizing both inside and outside of Congress, the House of Representatives passed an unprecedented resolution directing the president to end unauthorized U.S. military involvement in Saudi Arabia and the United Arab Emirates’ military intervention in Yemen that has helped create the largest man-made humanitarian crisis in the world." See full Win Without War statement. March 13, 2019 -- "This vote sends another strong message that US leaders are willing to take a stand for peace and political agreements that will save millions of lives in Yemen. We heard strong statements today in solidarity with the people of Yemen and calling out those who are disregarding their lives and futures in this human-made conflict. We hope the Trump administration listens and finally ends its role in Yemen’s devastating humanitarian crisis." See full statement. Experts* to contact: John Lindsay-Poland, Jeff Abramson, Colby Goodman, Christina Arabia, Rachel Stohl, Brittany Benowitz, William Hartung. 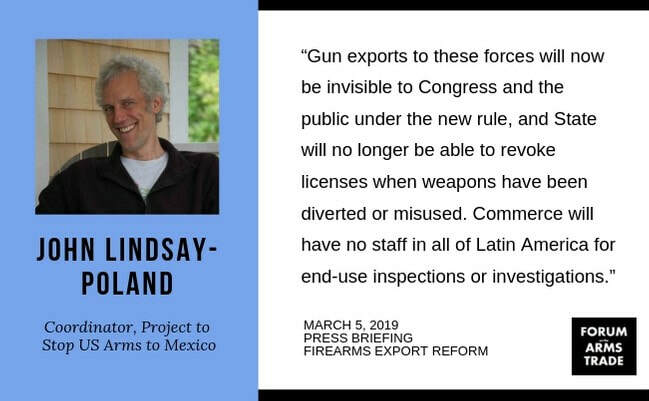 Additional experts suggested include Kristen Rand at the Violence Policy Center and Susan Waltz at the University of Michigan. Written testimony is available from Susan Waltz (pdf) and Jeff Abramson (pdf). Experts* to contact: forthcoming. Additional expert suggested is Mandy Smithberger at the Project for Government Oversight. 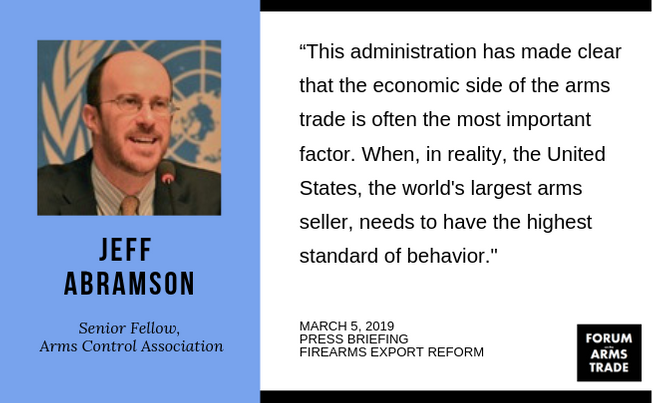 "How Congress Can Exert Responsible Oversight on Trump's Dangerous Approach to Arms Sales," Jeff Abramson, Issue Brief, Arms Control Association, Jan. 15. 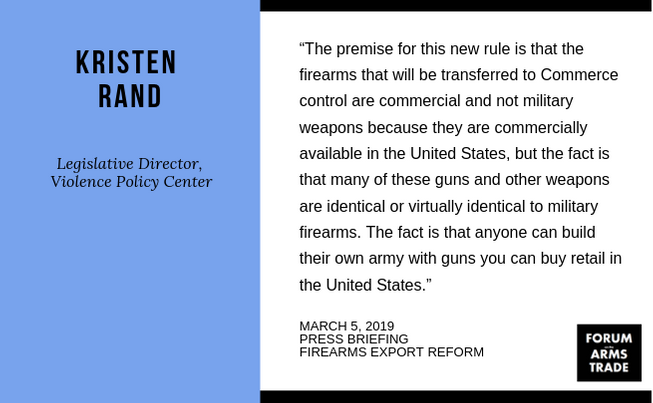 * Inclusion on the Forum on the Arms Trade expert list does not indicate agreement with or endorsement of the opinions of others. Please contact experts directly for comments.